Delavan Lakes Veterinary Clinic also offers bathing to ensure your companion is as healthy and happy as possible. We use high quality shampoos and conditioners along with a thorough ear inspection and cleaning. Regular bathing reduces shedding, promotes skin and coat health, and makes your pet smell and feel great. We use high quality shampoos and conditioners along with a thorough ear inspection and cleaning, and nail clipping. Cat grooming is a delicate task—and requires veterinary-supervised sedation and trained personnel to keep your cat comfortable and safe during the procedure. You can trust the process and the results when you bring your cat to us. Love your pet, but hate the shedding? We are a certified FURminator Shed-less Treatment provider. Within one to two treatments, the FURminator Shed-less Treatment has been proven to reduce shedding up to 90 percent. Even more effective with regular treatments, the Furminator is great for allergy-sufferers and cats that suffer from recurrent hairballs. 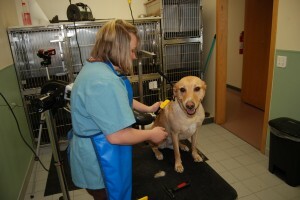 Bathing and FURminating can be combined with veterinary care and boarding. You are always welcome to visit our trained staff about any questions or concerns you may have before deciding to use our services. The FURminator Shed-Less Treatment will make both long and short-haired pets look and feel better! Within one to two treatments, the FURminator has been proven to reduce shedding up to 90 percent. Designed for cats as well as dogs. . . The FURminator Shed-Less Treatment makes particular sense for use with cats because it removes your cat’s loose hair before your cat can ingest it and vomit it back up as a hairball in a typically inconvenient place in your home. Fewer hairs means fewer hairballs. Recommeded by Doctors for people with allergies. . .
Allergy sufferers may breathe easier after your pet has had the FURminator Shed-Less Treatment. Reducing the amount of pet hair in your environment also reduces the amount of dander and airborne elements that cause allergic reactions in many people. Recommended by Veterinarians. . . The FURminator Shed-less Treatment has been endorsed by Veterinarians who understand the importance of maintaining a happy and healthy pet. A few things to remember. . .
-Excitement and stress can trigger hormones that can cause your pet to shed, and you may experience some of this in the first 12 to 24 hour after you take them home. -The FURminator Shed-Less Treatment is even more effective with regular treatments performed every 4 to 6 weeks. Hopping into the car, I knew that today was going to be an adventure. 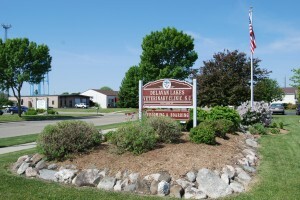 As we pulled up to the Delavan Lakes Veterinary Clinic, I was on my best behavior. I leapt right out of the car and walked my owner up to the doors. I did not mind that I was at the vet because today I was going to be FURminated! I met April, a certified FURminator Shed-less Treatment provider, and it was friendship at first sight. April reassured my owner that the FURminator Shed-less Treatment has been endorsed by Veterinarians who understand the importance of maintaining a happy and healthy pet. I could not believe my eyes! All of my winter undercoat was coming off! No more licking and getting fur stuck to my lips. No more terrifying vacuums chasing me around the house. No more “Get off the couch!” And it felt great! I was probably the happiest pup in the world at this point. Undercoat… gone! Which means less cleaning time for my owners and more play time for good ol’ Chevy! Then came the bath… April tried explaining that it was only water, but let’s face it, no dog likes getting a bath. And I am no exception to this! April used a high quality shampoo and conditioner (which is their TOP secret method), along with a thorough ear inspection and cleaning, and she even clipped my nails. But just when I thought I was beginning not to enjoy this vet visit, April brought out the blow dryer! I loved the warm air blowing at my clean fur so much that I leaned into April to show my appreciation. It felt so nice. Then afterwards I was brushed again. I looked about 10 dog years younger! My owner was even impressed! April told me how wonderful I was and thanked me, I was sure to thank her also. One of my owners will now be able to breathe easier after I had the FURminator Shed-Less Treatment. Thanks to my clean ears, I over heard April telling my owner that reducing the amount of pet hair in your environment also reduces the amount of dander and airborne elements that cause allergic reactions in many people. I pulled my owner straight out the door and couldn’t wait for all the neighborhood dogs see the new and improved Chevy!